Inspector blogging: On the buses. And on a lighter note, you might want to read this one with a cuppa and a good dunking biscuit. 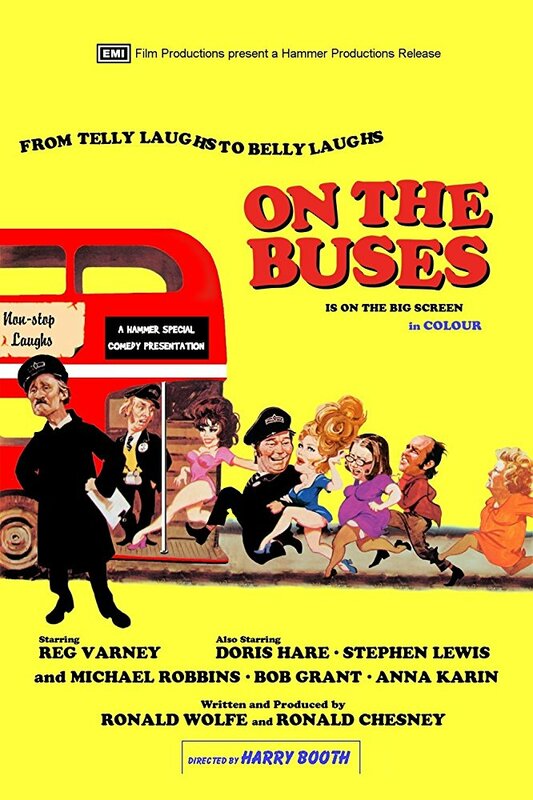 Do you remember On the Buses? Rainbow? The A Team? My former colleagues on C Relief probably do. They are TV shows from the 70s and early 80s. They were used extensively as references during my trial. It took place at the end of a late shift about a week after "the incident". I was summonsed to a C Relief Kangaroo Court. Now, Kangaroo Courts are one of those things that were acceptable in the '70s and '80s but are probably best left there. They consisted of a gathering of colleagues, usually in the canteen if it was when the bosses had gone home or a pub at other times. They were where any Constable who had committed an offence against the Section was weighed off, that is punished. It was not so much a place of summary justice, as instant sentencing. But sentencing did have to wait until the the "brief circumstances" of the incident had been colourfully recounted. My offence had been to embarrass the Relief. My guilt was taken as read. My plea was utterly irrelevant. It happened here, at this bus stop. I think Tears for Fears were at number 1. I remember it was a Sunday on a dry clear, yellow street lamp lit evening coming up to 9.30pm. I was walking back from a foot patrol on a distant beat, trying not to see anything untoward so I could get away on time. I remember thinking if I was quick I could get the 10 past 10 westbound tube and be home just a bit after 11. It was a quick change over between lates and earlies so I’d be up just after 4 to get to the tube station so I could travel back into town and the start of shift at 6am. Then I heard it on my PR, or personal radio. 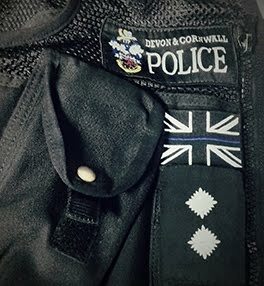 The black microphone that was held to the lapel of my tunic with a bent silver clip clicked and hissed. The lead to the microphone had a fabric covering which went under my tunic and round my back to a dangling Stornophone appendage clipped to my belt. It banged against the back of my right thigh as I did the Old Bill foot swinging walk that is foot patrol. “Yeah, any unit able to take a fight on a 207 bus at..” and then my C Relief colleague on comms duty gave a location uncomfortably close to my own and worse still, one I had to pass to get to the station. If you look at the picture I was about 100 yards down the road you see to the right of that wonderful red brick block of flats. I really can’t remember what I responded on the radio but my inside voice said some naughty words. I then started to run, ignoring the ten inches, two pound lump of electrical circuitry leaping around on my belt and thumping hard into any part of my anatomy it could reach. That’s why it was at the back of my right thigh, and not the front. At the same time I was attempting the “foot chase three piece juggling act”. First is the "helmet grab". It is not so that you can hold on to it but so you can at least drop or throw it somewhere you will probably be able to find it again later. Next comes the "truncheon check or pull”. Your stick, which normally sat passively in an extended sleeve at the back of your right trouser pocked, worked it’s way up as you ran. If you had forgotten to loop the strap around your belt it eventually fell out. That’s the "check". If you thought it would be a fighty incident, you could slip your thumb through the strap, pull up and swing your hand backwards. The strap wrapped around the back of your right hand and the grip of the truncheon landed in your palm. That’s the "pull". Then finally it’s the “radio block”, which is your right hand going across the front of your face to stop the microphone smacking you on the nose. The clip always failed, the microphone tumbled down the front of your tunic until the fabric covered lead stopped it. At this point the microphone and lead acted like a weighted pendulum, swinging between your legs and then arcing back up until the microphone is saved from being damaged by being safely stopped by your face. Anyway, with my helmet dropped behind the hedge (it was there even then!) my truncheon strap still around my belt and a sore nose I saw a fairly well built fellow punch two boys whilst a third had jumped on his back. It looked like a human rodeo. They were on the pavement next to the rear passenger platform of a number 207 London Transport AEC Routemaster Double Decker Bus. A beautiful machine. It was claimed at my trial that whilst these next events unfolded I was humming the theme tune to “The A Team” whilst pretending to be Mr T. I dispute that. What happened was that I had empty hands, no longer had a helmet and was faced with a right royal fist fight. There wasn’t time to get my truncheon out and shouting "Police, stand still" had exactly the effect you would expect. I thought I was looking at the back of a full grown man having a violent go at a bunch of kids. I did what anyone who had only recently left their teenage years would do; what I knew, which at that time was to play ruby. I sprinted the last 10 yards and dropped my right shoulder so it hit the big bloke at waist height by his left hip and drove through with my legs. Had it been on the rugby field, within my own 22 yard line and I was driving for the touch line it would have been a beautiful thing. But it was neither. Apparently it looked like a game of human skittles. I remember seeing one of the boys leave the ground and end up the other side of the hedge. My head hit the pavement. It hurt. I flapped and flailed around a bit and managed to get hold of punching bloke’s right arm, keep him face down in an arm lock and snap on one cuff. As I looked up there she was; silhouetted against the lights of the passenger platform. It was like seeing the legs of the lady that does the cleaning in Tom and Jerry cartoons, but this time with the top half as well; a scary top half too. With hands on her hips, wearing a grey London Transpot uniform and giving me a look that would curdle milk she was the most authoritative figure I had ever seen. Nestling on her chest was one those ticket machines that look like a grey enamelled cash till, and at her hip was a leather money pouch. It was the bus conductor. The next few seconds are a little vague. I don't remember exactly what she said, but I seem to recall being asked what I thought I was doing. The words stupid, boy, robbery, knife, them, off duty and help were in there though. I also remember faces pressed against bus windows and interested onlookers leaning over the flat balconies. They all seemed very interested. Anyway, with my punchy man arrested I wanted to find my young victims, who didn’t seem too keen to talk to me. There must have been five or six of them, which I hadn’t realised before. Then the one who was furthest away started to run away – with my helmet! Punchy man and I had now stood up. The perceived wisdom then was that if a copper lost a prisoner the discipline side would cost them two day’s pay. I didn’t want to lose two day’s pay so I snapped the free cuff to the upright grab pole on the passenger platform before I went after my victims. The bus conductor and punchy man looked at me like I was stupid. But I do remember more words coming my way, the ones that stuck in my mind being similar to those above but with more emphasis on the “stupid” and one new word “gang”. It was not so much that the penny dropped, as the pole axe struck. The “young victims” were a gang who had tried to rob the bus conductor at knife point when the off duty conductor came to her aid and fought with the robbery gang until a police officer knocked everyone over, handcuffed the victim to a bus and let the robbers get away. I turned, hurdled the hedge and sprinted after the rapidly receding figures. By the time I got to the corner, they had vanished. I swore between breaths. But as I looked down I saw one of the little darlings not 2 feet away trying to hide himself and his butterfly knife under the hedge. With the butterfly knife in one hand and the scruff of my new prisoner’s collar in the other I marched back to the bus stop. It looked very different. There was no bus. I later learned that the driver saw me run past him going after the suspects and he figured he would leave me to it. He knew nothing of his bus’s new human fixture on the passenger platform. The audience hanging over the flat balconies were still there though. I felt a bit dazed as I stood there with my hands full and the microphone of my PR hanging in the space between my legs like a parody of the Fleetwood Mac, Rumours album cover. Then the air horns heralding the arrival of my colleagues could be heard. The next few minutes were excruciatingly embarrassing as I explained what had happened. Apart from arresting one of the victims, allowing at least four suspects escape and losing my helmet and cuffs I had caused quite a scare when I lost control of my personal radio microphone. My colleague on comms duty had been calling for an update and when one had not been forthcoming he had "patched through" to the area wide radio network and called "urgent assistance" on my behalf. It sounded like every copper in my half of London was on their way. Our Area Car driver stood them down, but I had to make the radio transmission asking very nicely for police to stop any London Transport 207 buses going west, and to check if they had anyone hand cuffed to the grab rail. I did not get the ten past ten tube train. So it was that I found myself standing in front of this Kangaroo Court a week later. My sentence, well I was awarded a nick name "suitable for an officer who is too nice to children". I was "Bungle" for the next six months. If you've ever seen Rainbow that will make sense. I also earned myself "tea duty", which included post shift washing up, for two months. It was almost a year later, when I was a little wiser and my boots a bit more scuffed and Bungle had long been abandoned as yesterday's joke that I found a scruffy newspaper cutting stuck to my locker. It was a small black and white version of this poster. It's the back of an AEC Routemaster double decker bus. PS - Drive safe, be kind, don't steal. Here I would like to point out that being on the "bench" that handed out the sentences of the type that were handed out then would today get someone in to lots of trouble. However, to a man and woman all the officers who were at these proceedings, apart from me have retired long ago. I feel it is safe to share this story now. Thank you Jennifer. Sorry it took so long to reply. Thank you Roni. Hope you are well.